This is no ordinary group of school children. It's a special history class at Dayspring Academy in Greenbrier Tennessee. Seen here the class is viewing an old tree in a property line of Thomas Kilgore's 640 acre North Carolina Land Grant. We think the date is most likely 1785. Seen Front L - R Derek Lamberth, Andrew Sims, Caleb Primm, Teacher Heather Frizzell, Andy Suttle and Jessica Duke. Seen in the back are Mary Massie on the left and Savannah Eller on the right. This class has tackled tough questions as to the possible location of Kilgore's Station and while the exact site is yet to be proven a selection of possible pioneer relics discovered by class members suggest a location which may just be the site. More on that topic later. Paula Eller and her father, Ted Melton have helped mentor this very gifted class. 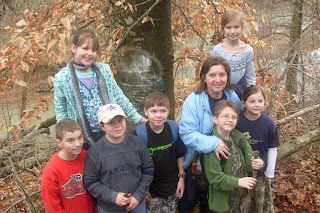 Field trips allow the class to gain insite to Robertson County Tennessee history in ways that few ever enjoy. New News page today - I'll have to determine content and direction.